Oh, the winter blues. They make you long for summer’s sunny skies, trilling birdsongs and warm breezes. During the winter and early spring — when I'm sitting in my office — I watch a live stream on my computer of birds at a feeder. It’s a poor substitute for the real thing, but it keeps me going during the “indoor season” while we plan for the summer field season. Because I do stewardship work for the Nature Conservancy of Canada (NCC), I spend a lot of my time out in the field taking care of our conservation areas. Although I tell people I am based in Halifax, the truth is that in the late spring, summer and early fall, I am working outdoors all over Nova Scotia, and my field work takes me on many adventures. Kayaking adventures are my favourite, and I’m lucky enough to go paddling on the job at least once a year. With kayaks on the roof, it’s a 40-minute drive down a winding coastal road from Halifax to Musquodoboit Harbour. The community of Musquodoboit Harbour is well known for Martinique Beach, a provincial park and one of the Nova Scotia’s longest and most stunning beaches. NCC has been working in Musquodoboit Harbour since 2010, and the majority of our conservation areas here are islands — nine, in fact, all within the harbour. The only way for us to look after these islands is by boat. We usually go out to the islands by kayak, which sounds pleasant enough, but requires challenging paddling and excellent timing. You see, Musquodoboit Harbour is protected by Martinique Beach and opens to the Atlantic Ocean through a narrow inlet. At high tide, the water fills the shallow harbour (estuary). At low tide, there are only narrow tendrils of water winding through immense tidal flats. And as the tides rise and fall, the ocean rushes in and out of the harbour, creating strong currents and whirlpools. I love kayaking here because you can really feel the tug of the currents, and you can manoeuver easily in the boats. 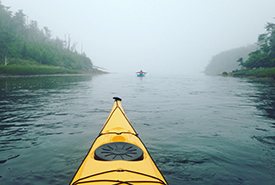 Paddling in Musquodoboit Harbour is one of my favourite things to do during the summer because it’s truly an adventure. It requires timing because the tide changes roughly every six hours, and you can’t walk on mud flats. If we end up there, and we don’t want to, it’s like wading through knee-deep mud filled with sharp rocks and clam shells. If we get beached, we could be one metre or one kilometre from the shore. This is neither pleasant nor conducive to visiting nine islands and two coastal properties in less than a day. Planning is an integral part to the success of this adventure. We need to paddle to the islands with a rising tide and then paddle back as it falls to make sure that there’s enough water to return to our starting point and not get stranded in the middle of the estuary. The trip requires stamina; the route requires almost four hours of continuous paddling with a few short breaks to install NCC signs, remove garbage and eat lunch. There are few beaches on the islands, so we usually bring our kayaks back on land by paddling them into the shoreline and scrambling over rocks. Most of the islands are pretty quiet these days in terms of human activity, but sometimes a hunch will take us to an old campsite with abandoned tarps and bottles. We collect and stuff what we can into the small hatches located in the backs of our kayaks. The rest…well, we mark the spot so we know to return there the following year. I should mention that I have been paddling since I was a child, and I love kayaking along the coast. The route I take here is not one I would recommend to a new paddler or someone entirely unfamiliar with the changing coastal water currents. It’s not overly difficult, but every year there is a lot of planning that goes into this adventure, because the tides and the weather are always changing and both play a major role in this adventure. 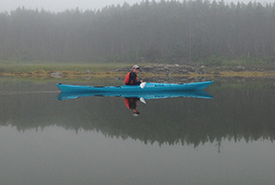 I’ve paddled to the Musquodoboit islands in the fog on calm waters and under the blazing August sun on a windy day. I’ve seen deer swimming through a channel in the distance and spotted kingfisher and osprey diving for fish. Every year is different, but the same, and I love it. 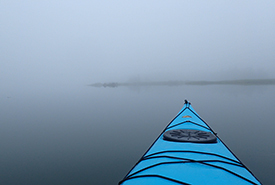 I recommend planning your next outdoor adventure on a rainy spring or stormy winter day. It doesn’t have to cost much or even take you very far. Sometimes, you can find your next adventure just down the road. 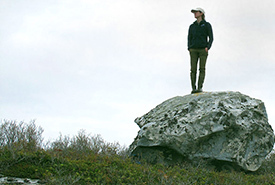 Danielle Horne is a Nova Scotia-based conservation biologist for NCC's Atlantic Region. 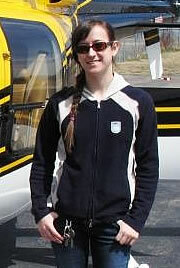 Read more about Danielle Horne.